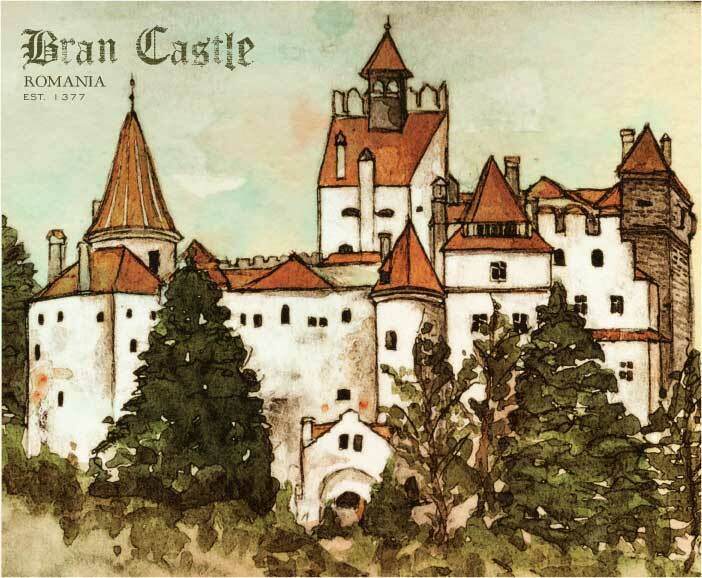 In celebration of my favorite holiday, I’ve painted Bran Castle. This castle was the inspiration for Bram Stoker’s, Dracula. Although there is no evidence that Stoker ever visited the castle, it does have a very dark history. Stoker’s Dracula was based on an actual villain, Vlad the Impaler. In the 1400s, Vlad ruled Transylvania. He was a terrifying and cruel ruler and responsible for 80,000 deaths- mostly those who opposed his reign. Dracula was actually his father’s name. Vlad, proving to be a fearless warrior (there had to be better ways) invoked a terrifying psychological warfare as a way of intimidating his people. As you can probably guess, his nickname “Vlad the Impaler” was given due to the fact he like to impale his victims on shape spikes throughout his lands. What makes it even more gruesome is that he put them on the top of the spike, alive, and let gravity pull them down. Bit of a sadist. His most offensive and horrific torture was reserved for women, especially pregnant women. There are records that indicated he drink his victims’ blood and dined on elaborate feasts next to those slowly sliding down the spikes. Evil. Pure evil. At the time, the area was quite lawless, so some historians believe his methods were necessary. Some Romanians still view him as a hero. WHAT? uh… ok. I’m open to discussion, but it’s going to be hard to sway me to believe he was anything but a monster. Anyway, back to Bran Castle. It is often thought to be the official home of the fictitious Dracula, however, there is a very vague connection to the book, the author, or Vlad the Impaler. It was used by Vlad as fortified citadel on the fight with Turks after he conquired Brasov in 1460. Towards the end of the 13th century, it was taken over by the Saxons in that region in order to protect the City of Brasov, an important trade center. It would seem, from doing some research, that Vlad only spent a short time on the castle grounds. Bran Castle continues to make top ten lists for “Most Haunted Castle in Europe” and is only second to Leap Castle in Ireland. The Castle’s Official website is here: http://www.bran-castle.com. Be sure to watch the home page video, it’s breathtaking.